For the opening reception of the refreshed Te Papa art exhibition Collecting Contemporary held on February 22 2012, Taualuga: The Last Dance, 2006, a performance work by Samoan/Japanese artist Shigeyuki Kihara was presented. 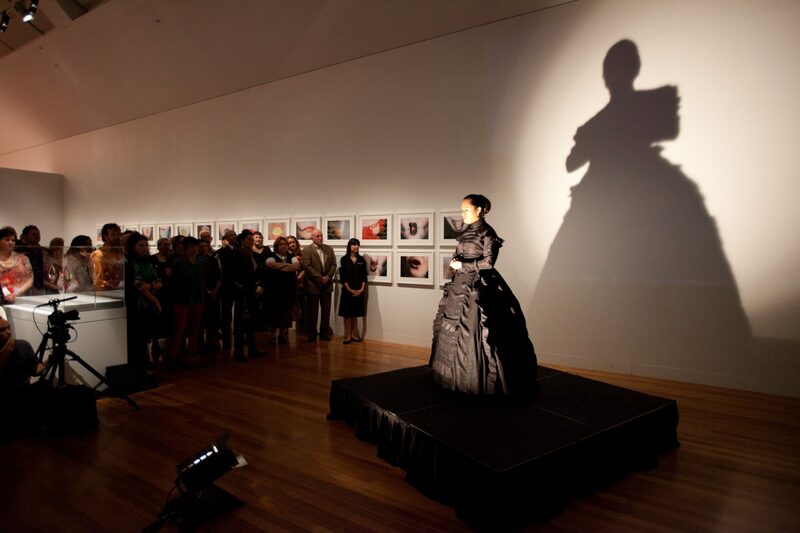 Staged in the gallery where the Collecting Contemporary exhibition is displayed, the performance was realised alongside the video of the performance work gifted to the Te Papa art collection by the artist in 2011. Created initially as a performance work then later as a video work, Taualuga: The Last Dance, 2006 (both performance and video) respond to a series of historical photographs taken by New Zealand photographers including John Alfred Tattersall, Thomas Andrew and the Burton Brothers during the colonial administration of Samoa by New Zealand between 1914 till 1962. Many of the photographs referenced by the artist are held in Te Papa’s photography collection. Using the principles of the classical Samoan dance of Taualuga – a dance of negotiation and celebration – as a form of storytelling, Taualuga: The Last Dance, 2006 is simultaenously a celebration of and a tribute to the many leaders and people of Samoa and their resilience in their struggle for independance and a lament, acknowledging the changes and losses for Samoan culture through the process of colonisation. The work made reference to the Mau movement establised in 1908, through which Western Samoan’s began to assert their claim to independance and also to New Zealand’s occupation of Western Samoa and to the history of our (New Zealand’s) role as colonial power within the Pacific. The sense of loss in the work and struggle for power was expressed through the wearing of a restrictive Victorian mourning dress – a style of dress introduced to Samoa by the German colonial administration in the 1900’s – and by Kihara’s attempt to perform the graceful movement associated with the Taualuga while wearing this dress. The performance for the opening reception of Collecting Contemporary was the first showing of this work in New Zealand. An encore performance was held as a public programme event in the afternoon of the next day, so it could be experienced and enjoyed by the public. Taualuga; The Last Dance, 2006 has been peformed previously in selected venues including The Haus der Kulteren Der Welt, Berlin, Germany, the Musee du Quai Branly, Paris, France and at the Metropolitan Museum of Art, New York, USA. Both Te Papa performances were managed by Te Papa Events Producer Tai Patai and both were dedicated by the artist to the work and legacy of the late Jim Vivieaeare. Jim was a Pacific art curator of Rarotongan and Tahitian descent, who broke ground with his seminal exhibition Bottled Ocean (1994), one of the first survey exhibitions of contemporary Pacific Island art. Kihara’s two peformances were a fitting tribute to him.